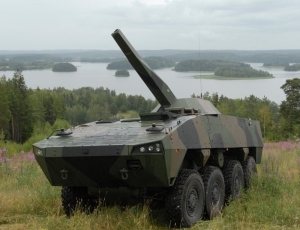 The Slovenian Ministry of Defence has today signed agreements with Rotis and Patria covering 135 Patria AMV 8x8 vehicles as well as Patria Nemo 120 mm single-barrel mortars to the Slovenian Army. Patria’s new mortar system, Patria Nemo launched in June 2006 now records its first international business deal. Both products represent the newest technology on the market and offer unique protection and performance. Production will gradually be transferred to Slovenia in 2007 and 2008. Together with Patria and Rotis, Gorenje will also be involved in the production. The value of the agreements is EUR 278 million. Patria is a Defence and Aerospace Group with international operations. Its key business areas are armoured wheeled vehicles, mortar systems, helicopters and military aircraft, their life cycle support and defence electronics systems. Patria delivers inter-nationally competitive solutions to global markets based on own expert know-how and partnerships. Rotis d.o.o. was established in 1990. It started to operate as a trade company and in 1994 initiated its own production. Rotis is among the fastest growing companies in the Slovenian metal industry. During the period 1994 – 2005 the company has achieved on average a 40% annual growth of net sales. The company sells pipes, steel, machines and represents many major manufacturers of different mechanical and other special equipment. The Slovenian Ministry of Defence selected Patria’s AMV (Armoured Modular Vehicle) 8x8 vehicle as the preferred vehicle for the Slovenian Army in June, 2006. The deal covers 135 armoured wheeled vehicles. Patria Nemo 120 mm unmanned mortar systems are included in the deal. Deliveries are scheduled for 2007 – 2013. Patria AMV is currently the only 4th generation armoured wheeled vehicle in serial production on the market and is being deployed. Having superior performance and being fully NATO compatible, Patria AMV fulfils the toughest procurement requirements of modern defence forces. Patria AMV has over 1200 vehicles contracted or under final negotiations at present with expected approximately 200 Patria AMV 8x8 vehicles delivered to customers by year end 2006. Patria Nemo is an unmanned 120 mm smoothbore turreted mortar system featuring superior accuracy and agility, and it provides both direct and indirect fire support. Patria Nemo is based on more than 80 years of Patria’s own weapon systems expertise and know-how. It is suitable for a large variety of wheeled or tracked platforms and naval vessels. The versatility of Patria Nemo makes it an ideal solution for a wide range of different operational needs of modern land and naval forces.